Why I stand with MHP—and why you should too. Suffice to say, the segment has now gone down in the annals of partisan cable-news outrages, thanks largely to a barrage of posturing denunciations from right-wing voices Sean Hannity, Breitbart.com, Sarah Palin, TheBlaze.com and the like. Harris-Perry apologized on Twitter, and then again on the MSNBC website, and then again in an on-air monologue—not just to the Romney family but to all families created by transracial adoption. “I am deeply sorry,” she said, visibly distressed, “that we suggested that interracial families are in any way funny or deserving of ridicule.” Romney himself accepted her “heartfelt apology” this weekend on Fox News, saying “we hold no ill will whatsoever.” And that, at long last, should have been the end of it. I will add to all this just one point. If any of Harris-Perry’s conservative critics really cared about the actual substance of her views on transracial adoption, they could have easily found, quoted and linked to the multiple segments she has done on the subject. To the best of my knowledge, not one of them has. So here’s one telling example of how Harris-Perry has approached the issue. About one month after the verdict in the George Zimmerman trial came down, Harris-Perry convened a panel, inspired by a prompt from her white mother, that addressed how white parents might have “the talk” with their black children. The panel included Rachel Garlinghouse, a white mother of three adopted African-American children; Tracy Robinson-Wood, a professor at Northeastern who studies white mothers of non-white children; Rachel Noerdlinger, an African-American woman adopted by white parents; and Shanna Smith, a housing expert who is also the mother of two mixed-race children who identify as African-American. The panel discussed the issue of racial literacy, so that white parents who love and seek to protect their African-American children from racism can provide informed guidance. They examined the effect that integrated or segregated institutions and open adoption have on their struggles—and they also talked about how to do black hair. There was not a single partisan note in the entire segment, and with the exception of an aside about Bill de Blasio and his son Dante, none of it was particularly political, if by political one means electoral politics. And, at a time when racial polarization was particularly high, Harris-Perry made the creative choice of broadening the conversation so that “the talk” wasn’t just about African-American children as victims and white vigilantes as perpetrators, but also about white parents as protectors and protagonists. It was, in short, exemplary of the kind of smart, sensitive, unique and brave programming that has deservedly won Harris-Perry a legion of fans. The public is skeptical of transracial adoption, particularly, like in my case, a White parent who adopts Black kids. In the various radio shows and articles I’ve been a part of, the interview questions usually begin from a place of assumption and suspicion. Often I’m asked what my intentions are (in adopting Black kids), why we chose to adopt, what qualifies us to raise Black children and why we didn’t adopt White children. However, when we share parts of our family story, we can see some of the doubts melt away, and the questions turn toward subjects like how we help foster a positive racial identity in our children and how we care for their hair. I felt like when I was on MHP, I was respected from the get-go. The pre-interviews were non-threatening. I didn’t feel that I need to prove myself and my worth as a transracial, adoptive mom to Melissa, her staff or the other panelists. Being on MHP was the highlight of my year, after, of course, the arrival of my third child and the publication of my book. Does this sound like someone who has been race-baited to you? Of course not. But then, that’s not really the point of the conservative faux outrage. Harris-Perry’s critics would have a problem with this segment, too, simply because it began from the premise that racism still exists and that good people of all races have a moral imperative to confront it. What they lacked was not a motive, just an opening. 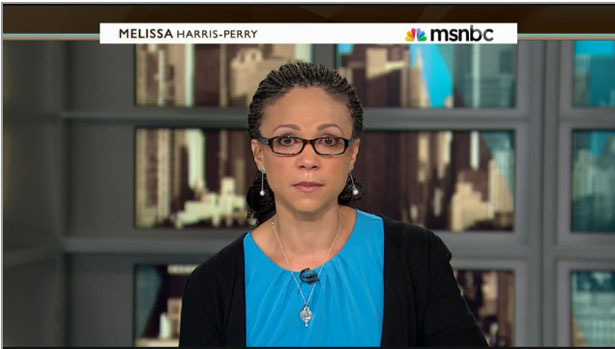 On a final note, as someone who has been a guest on Harris-Perry’s show, I’ll say that segments like this one aren’t just a testament to her talents and interests (although that too! ), but to all the producers and researchers who work on her show, the most diverse in all of cable news by a mile. And it also reflects well on MSNBC that they’ve given her the space to pursue such difficult, under-covered subjects with such care and intelligence. I hope they continue to do so—without fear or reservation.